We continue our discussion with the third example in this series. What is the base of a height 7 and area 8.75 square centimeters? Therefore, the height of the triangle is 2.5 cm. Two triangles are formed by drawing a diagonal from the opposite corners of a square. If the side length of the square is 8.4 cm, what is the area of each triangle? Now, since the area of the triangle is half the square, we divide 70.56 by 2 which is equal to 35.28. So the area of the triangle is 35.28 square units. 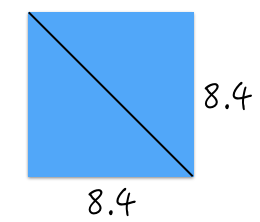 What is the area of the shaded part in the figure below if the side of the square is 8 cm? 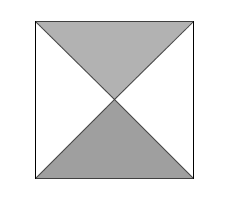 The area of the shaded part is half the area of the square. Since the area of the square is 8(8) = 64 square centimeters, the area of the shaded part is equal to 32 square units. Can you find other solutions? In the next post, we are going to have a quiz on what we have learned so far.